Last month, the Sporting Life meeting was at Sunny Spot. It was sponsored by Atlantico Rum which I hadn’t tried before. I got to taste the private cask rum as well as a punch and a couple of cocktails. I would have liked to have tasted all the cocktails offered that day but I had to run off to judge the Don Q LA regional. First I tried the rum Preakness (Atlantico Reserva, bitters, vermouth, Benedictine). The Preakness is one of my favorite bourbon cocktails so it was interesting to try it with rum. Next, I asked for the Air Mail (Atlantico Reserva, honey, lime, absinthe, champagne). Some bartenders wondered about this classic champagne cocktail that was served on the rocks but I actually liked it this way. 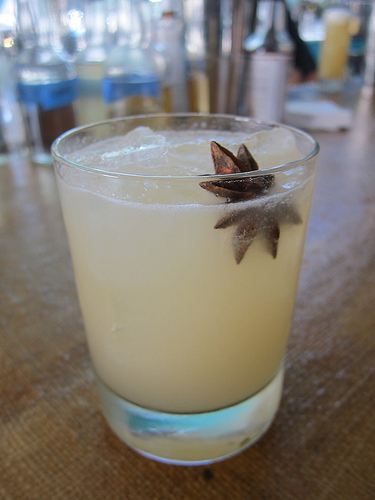 The star anise garnish was pretty. I wish I had tried this one as I really love swizzles and I believe Sunny Spot made their own falernum. The cask strength Atlantico was probably the favorite of the day. It’s very smooth and would be the perfect after-dinner drink to sip. I’ll have to keep an eye out to see if these cocktails make it to Sunny Spot’s permanent list or I suppose I can always ask for something with Atlantico and falernum! This entry was posted in alcohol education, alcohol tasting, bar stories, bars, bartenders, cocktails, events, history, hot bartenders, la, la cocktails, los angeles, spirits, the minty and tagged atlantico rum, bartenders, booze enthusiast, cocktailian, cocktails, enthusiast, hot bartenders, rum, sporting life, sunny spot, the minty. Bookmark the permalink.